The blog post associated with the report was re-tweeted by The New York Times’ Nick Kristof to his 1.3 million followers. 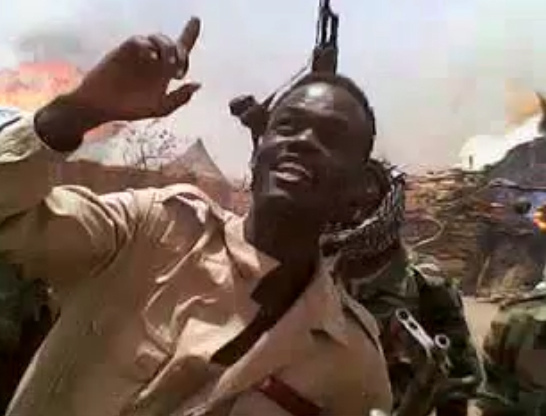 Maggie Fick's Associated Press coverage, “US group says video, satellite imagery shows Sudan forces razing village in border region,” was picked up by the Washington Post, the websites of Salon.com, ABC News, Fox News, and CBS News, and provided additional context to the report. Fick noted similarities between the situation in Darfur and the unfolding conflict in South Kordofan. This is a video that cuts through all the abstractions and obfuscations. In the United States, news organizations are focused on the second presidential debate tonight—but that event should not keep this documentation of an attack in real time from reaching a wider audience. In the past, the absence of cameras meant this violence could be ignored. Now, we have evidence that demands attention and accountability. In a VOA News article, “Monitoring Group: Sudan Forces Burn, Loot Village,” the government of Sudan responded to SSP’s report by characterizing it as a sensationalized "fabrication." But it had no comment on the fact that the cell phone video was shot by Sudan's own Abu Tira police, in uniform, and corroborated by DigitalGlobe satellite imagery, GPS-tagged photos, and eyewitness reports. United Press International, or UPI, published “U.S. group documents Sudanese violence,” and quoted Enough Project Co-founder John Prendergast. "Through this campaign of targeted violence, which amounts to crimes against humanity, and its denial of humanitarian access, the government of Sudan is displacing thousands of civilians and contributing to insecurity in the region," he said in a statement. SSP's report is one of the most comprehensive documentations of crimes against humanity to date. SSP and the Enough Project will continue to use this information to achieve the goal of monitoring and reporting on mass atrocities, to seek accountability for genocide and crimes against humanity.